A spin on the classic back-to-school favorite. Using a circle cookie cutter or wide circle glass, cut the bread slices into circles. Flatten the bread circle with rolling pin. 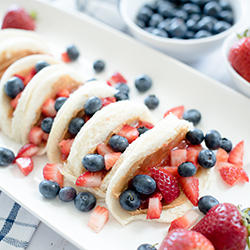 Spread peanut butter and jelly onto flattened circles. Top with diced strawberries and blueberries. Enjoy! 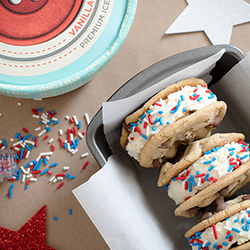 Creamy Red Button Vintage Creamery ice cream sandwiched between two soft chocolate chip cookies with a touch of red, white and blue. The perfect treat for your patriotic celebrations. If making homemade cookies, make cookies according to recipe instructions and let cool completely. Once cookies are completely cooled place a scoop of ice cream on the cookie and sandwich between another cookie. Place sprinkles on small plate. Roll edges of ice cream into the sprinkles. Serve immediately. For more tasty recipes with Red Button Vintage Creamery ice cream click here. 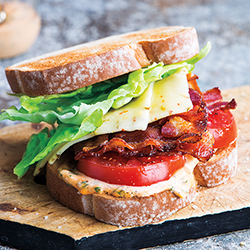 Enjoy this healthy and absolutely delicious breakfast (or any time of the day) sandwich! Combine arugula and dressing, set aside. Spread one side of each slice of bread with ½ tablespoon butter and place on broiler pan, buttered side up. Combine ricotta and Parmesan cheeses; spread ¼ cup over each slice of bread. Top cheese on each slice of bread with an equal amount of arugula. Heat 2 teaspoons oil in a large non-stick skillet; fry 2 eggs, until whites are set, about 4 minutes. 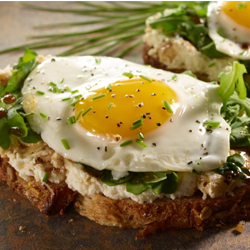 Place eggs over arugula on each sandwich and sprinkle with chives and pepper. Celebrate Earth Day with Full Circle! Full Circle’s mission is about health and happiness. We’re doing our part by offering best-of-nature foods and eco-friendly items you can afford. That’s our mission. All-around goodness. It means delicious food—mostly organic—to nourish your inside, and eco-friendly home and personal care items to nurture your outside. It means Full Circle Market. You want better choices. The simpler the ingredients, the closer to nature they are, the easier it is to choose what’s best for you and your family. You know what you’re getting with Full Circle Market. There’s not an item we offer that we wouldn’t want for our own families. We believe in keeping it real, and affordable. And with more than 1,000 products in stores across the country, we’re easy to find, too. Bringing you quality products that enhance the all-around goodness of your life has been our passion for more than a decade. Our desire to please you comes naturally. Start Earth Day off right with this delicious breakfast sandwich!